Astrology is a long-established method of exploring ourselves, our relationships and our place within the world. It works by taking a look at the significant environmental influences operating in a particular place at a given time - as expressed through the horoscope in the symbolic relationships of the heavenly bodies. Astrology, the science of the stars, can give us insight into all manner of situations, from the personal to the political and from the most intimate to the most mundane. Astrology is a system of observations gathered through ages. 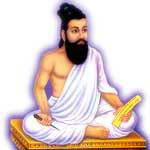 For an example Vedic Astrologey was founded by Sage Parashara thousands of years ago and the observations collected through ages are the essence of the Hindu Astrology. Astrology, both Eastern and Western are based on a predictive system very similar to to the one used by meteorology. Instead of forecasting the weather conditions, Astrological predictive system indicates such and such things are highly probable to happen to the people when such and such planetary positions are prevailing. Stars only indicate your past "Karmas"( or the actions ) and depending on the past actions, the direction of the path of life you are going to take while in the journey, towards the ultimate goal the: "Natural evolution process towards the Perfection of Mind" * "kingdom of heaven", "Moksha", "Nirvana" or where ever according to your personal belief. It is as same as, depending on the lane you have stopped, the direction you should turn will be indicated by a traffic signal. The earth revolves around the Sun once in 365 days 5 hours 48 minutes and 46 seconds. Considered from the earth, the Sun appears to complete one round of the ecliptic during this period. This is called a tropical year .In the span of a tropical year, the earth regains its original angular position with the Sun. It is also called the year of seasons since on this Earth-Sun cycle depends the occurrence, and timing, of seasons. If we consider the revolution of the Sun around the earth from one vernal equinox (around 21st March, when the day and night all over the globe are equal) to the next vernal equinox, it takes one tropical year to do so. However, if at the end of a tropical year from one vernal equinox to the next, we consider the position of the earth with reference to a fixed star of the zodiac, the earth appears to lie some 50.26 seconds of celestial longitude to the west of its original position. In order for the earth to attain the same position with respect to a fixed star after one revolution, it takes a time span of 365 days 6 hours 9 minutes and some 9.5 seconds. This duration of time is called a sidereal year .The sidereal year is just over 20 minutes longer than the tropical year; this time difference is equivalent to 50.26 seconds of celestial longitude. Each year, the Vernal equinox will fall short by 50.26 seconds along the zodiac reckoned along the fixed stars. 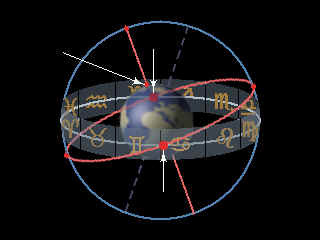 This continuous receding of the Vernal equinox along the zodiac is called as the precession of equinoxes. This in other words, means that the plane of the equator intersects the plane of the ecliptic at a constantly shifting point. This point, the first point of Aries or the vernal equinox, goes on receding westward at a rate of approximately 50.26 seconds of arc each year. This is called the precession of the equinoxes. The result of this precession is a slow increase in the right ascensions of almost all fixed stars in the zodiac. This precession takes some 25,800 (or approximately 26,000) years to complete one circle. As will be seen, an appreciation of this precession is of paramount importance in the understanding of the basic concepts of Vedic astrology. It has been seen that because of the precession of equinoxes at a rate of 50.26 seconds per year, the distance between the Vernal equinox (the 1st point of the movable zodiac) and the 1st point of Mesha (Aries) on the fixed zodiac has been progressively increasing. This distance at any given epoch is called as the Ayanamsha .The ayanamsha thus indicates the difference between the fixed zodiac and the movable zodiac. The system that considers the fixed zodiac is called the Niryana (without ayana!) system, while the one that considers the movable zodiac is called the Sayana (with ayana!) system. The Niryana values of planetary longitudes can be obtained by subtracting the ayanamsha for a given time from the Sayana longitudes. The Niryana and the Sayana zodiacs coincided in the year 285 AD when the ayanamsha was zero. At the rate of precession of equinoxes stated above, the ayanamsha on the 1st of January, 1995 is 23°47"26". The equinoctial precession completes one round in aproximately 26,000 years, as mentioned earlier, so that the fixed and movable zodiacs coincide regularly after this time span. The ayanamsha reckoned on the basis of considering the year 285 AD as the year when the Sayana and the Niryana zodiacs coincided. The Ayanamsha is based on the position of the constant star Spica. Intermediary data can be calculated by interpolation. Some Western computer programmes offer the possibility to make a calculation based on the sidereal zodiac. However, sometimes the ayamamsha for the sidereal zodiac used in such programs is slightly different than the Lahiri Ayanamsha. So, it is valuable to calculate the planetary positions by hand. How do you start? First you take the positions from the Western horoscope and deduct the relevant Ayanamsha. For example: a person born in 1950 has the Sun on 25° Pisces. The Ayanamsha for 1950 is 23°10´. Deduct this from the position of the Sun: 25° - 23°10´ = 1°50´. Therefore, the Sun in the Vedic horoscope will be on 1°50´ Pisces. Now let us make it a little bit more difficult. Another person born in 1950 has the Sun on 15° Pisces in the Western horoscope. The Ayanamsha for 1950 is 23°10´. Deduct this from the position of the Sun (23°10´ - 15° = 8°10´ then 30° - 8°10´ = 21°50´). The Sun is now 21°50´ Aquarius. Continue calculating in this manner with the remaining planets and the ascendant. Bad Planetary Influence. What is it? Bad Planetary Influence is nothing else than a weak moment in your life, when the resulting reactions of the undesirable actions (Bad Karma"s) of your past, gain a window of opportunity to cause you unpleasantness. A simplified example is: while you are driving very fast (a weak moment), you happen to come in to a stretch of bad road and it is raining (malefic conditions ). Your tires are bad since, you did not care about those in the past (past bad karma), so just think what can be the result if you happen to break (opportunity) hard!